The Staten Island community that didn’t rebuild after Sandy. In one community in Staten Island, rather than rebuild, residents have ceded their former neighborhood to nature. 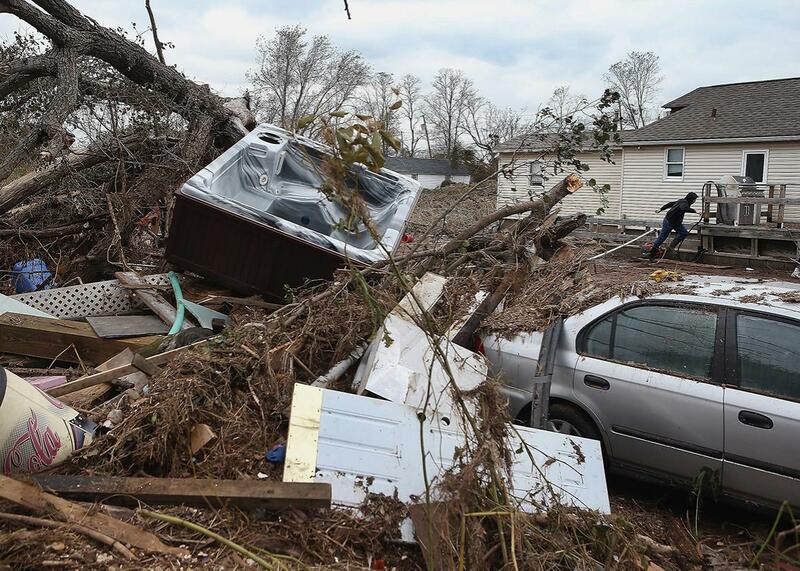 A hot tub lies in a pile of debris on Nov. 1, 2012, in the Ocean Breeze area of Staten Island. Five years ago, Superstorm Sandy—a monstrous post-tropical cyclone with hurricane-force winds—struck New York, bringing record-breaking wind gusts and deadly flooding. In New York City, 53 people died—nearly half of them were from Staten Island. The Ocean Breeze, Midland Beach, and Dongan Hills communities were especially hard hit, with 11 fatalities. A few months after the storm, WNYC reporter Matthew Schuerman described the square mile that makes up parts of these communities as “the most dangerous place to be in New York City” during Sandy. Joe Herrnkind, a middle-aged man who moved to Ocean Breeze in 2000, remembers those days, as he walks through the deserted streets of his once tightknit beach community. Most of the homes have been torn down, and a few are boarded up waiting to be demolished. The homes that do remain are surrounded by empty plots of land where wild turkeys wander. Unlike many other New York victims of Sandy, who have rebuilt their communities, those from these neighborhoods knew that rebuilding was not the best option. Some sold their land to developers, and a few others, like Herrnkind and his neighbors, sold their land to the governor’s office so it can be returned to its natural state. Recent hurricanes Harvey, Irma, and Maria have all raised the same question: What is to be done with the dozens of towns and cities in Texas, Florida, and Puerto Rico that have developed infrastructure on vulnerable flood-prone land that routinely requires massive cleanup and rebuilding efforts after each disastrous storm? Altogether, the recent storms could cost up to nearly $400 billion in damages. But some communities and local leaders are starting to realize that this model won’t break the cycle. In Ocean Breeze, instead of rebuilding on vulnerable flood plains, some residents have chosen to leave old neighborhoods behind and let nature take its course. Sandy’s peak winds were recorded at 115 miles per hour, and Staten Island saw wind gusts of up to 80 miles per hour. Father Cappodano Boulevard, the main road separating Ocean Breeze from the Atlantic, rose several feet above the side streets. Sandy’s unprecedented 16-foot surge overtopped the roads and poured into homes. A few days later, when Herrnkind was able to return, he had no idea whether his home was going to be standing. The city estimated that more than 300,000 homes were damaged by the storm’s flood. “An officer told me ‘You can’t go down there,’ ” Herrnkind recalls. When he finally arrived, the water was still nearly waist deep. “It’s still there,” he remembers thinking when he first saw his house. “I have something to work with.” The watermark on a lamppost today shows that the storm surge reached far above his head, which explains why his furniture and all his personal belongings were gone. Another option for some homeowners was a program from the Governor’s Office of Storm Recovery, which has been buying houses that were destroyed or substantially damaged and transforming them to open space and wetlands. The goal is to create a natural coastal buffer that can protect communities from future storms. In late 2013, more than a year after the storm, Gov. Andrew Cuomo announced that Ocean Breeze would join Oakwood Beach as a town eligible for state buyouts, and Herrnkind’s entire block was included. Reluctant to “put someone else in harm’s way,” Herrnkind concluded that he and his neighbors should take advantage of the state buyout program. He was able to sell his home to the state at pre-storm value and move elsewhere on the island. So far, more than 600 homes have been purchased through the buyout program. Once the sale goes through, the state government demolishes the home and lets nature reclaim the land. Today, Ocean Breeze is mostly empty, but complicating matters are the residents who refuse to leave. In Oakwood Beach, where most of the land is going back to nature, remaining residents struggle with lack of trash pickup and crumbling roads. One of Herrnkind’s former neighbors who stayed behind is an elderly woman who feared her children would put her in a nursing home if she left. Some opted out of the program because they didn’t have the proper paperwork required to sell their homes. Others didn’t want to give up their homes in a community they loved. On Herrnkind’s section of the street, only one home remains out of eight. “Around here, 90 percent of each block went,” he says, “and only one or two people stayed.” Just down the street from where Herrnkind used to live, more turkeys mill about on empty lots where homes used to be. Herrnkind’s former neighbor Frank Moszczynski, a tall man with a large presence, took the state buyout and moved to another neighborhood on Staten Island. He doesn’t have much sympathy for someone who willingly stays in a vulnerable area. “Why should … emergency workers have to go out and risk their lives for someone who chose to stay in harm’s way?” he asks pointedly. Today, the only thing protecting Ocean Breeze from another storm is a 4-foot hill of sand.